For a lot of us, website footers are utilitarian in nature. Their main function is to hold the “copyright” or “trademark” claimer. To tell the world, “hey! I own this website and the law prohibits you to steal it or its content”. Makes perfectly sense, we do want to protect our content and the footer is a perfect place for it. We do not want to scare our visitors by putting it at the top, but we do want to have it somewhere accessible. And then, we expand it to include about us section, extra links that we do not have enough space for in our main content area (I’m guilty on this one), links to our friends’ website and including but not limited to SEO. The point here is that the footers are utilitarian in nature for a lot of us. They serve a function or functions for the website. A few fun-renegades designers decided that they can have fun with the footers. Yes, that they still serve some purpose but can be wrap around a cute and engaging aesthetics. 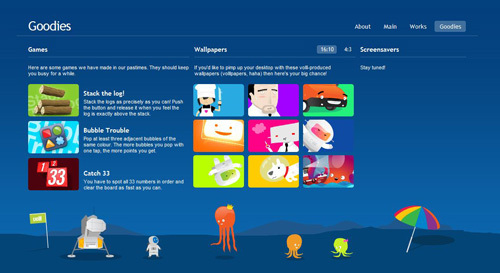 Below are some of the creative and cute website footer designs that I found. 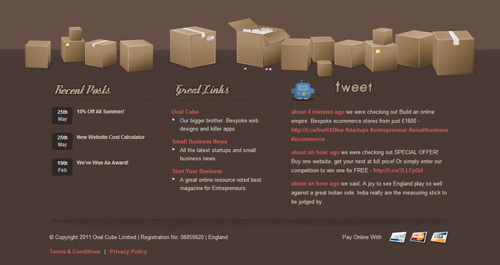 Feel free to post a link to your website or other website that has creative and cute footer design. 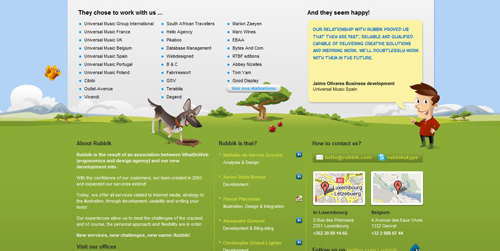 http://jenskanis.nl – A Dutch designer website. http://twither.info/ – A Russian weather website. http://readymadedesigns.net/ – A Russian weather website.